The cards illustrated below were designed by Axel Rosmann and printed chromolithographically in Estonia by the State Printing House in Tallinn, c.1930. A full-sized pack and a patience pack were produced. 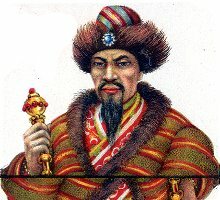 The designs of the court cards reflect Estonia's early history, showing Calmics/Tartars from Russia and Gypsies or Persians who had migrated. Click here to see the wrapper. 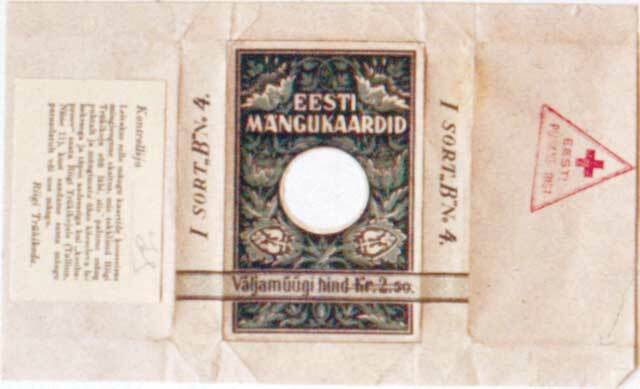 The court cards and indices on Estonian playing cards are Södur, Emand,Kuninga. See article by Jānis Mētra in The Playing Card, vol.32, no.4, Jan-Feb 2004.